Get your customer receipts directly into Xero. If you’re using Xero as your accounting solution then it’s pretty easy to have your YourCloudTelco customer payment receipts added directly into Xero. You will need to subscribe to both Zapier and MailParser to facilitate this process. These are both excellent cloud services and we’re sure you will use these for automating other processes in your business. There is a small monthly subscription and it is very well worth the investment. Here’s the simple explanation, and steps to help you set this up. We recommend using mailparser.io to extract the billing information needed for Xero from your email. It is easy to use and appears to be the most accurate parser available, and works seamlessly with Zapier. Login to your mailparser.io account and Create a new Inbox and take note of the address, eg pmtixrqo@mailparser.io. You will need to forward a sample email to this inbox so you can extract the information you need to sent to Xero, so make sure you send one of your YourCloudTelco receipt emails. 2. Get mailparser.io to extract the information Xero needs. Go to mailparser.io and specify what information you need to extract. This is done once only and then you shouldn’t have to touch this again. 3. Create a webhook between mailparser.io and zapier.com. Now that mailparser.io has the information you need for Xero, you connect to Zapier with a webhook, which is just a key you add in. 4. Create a Zap to send the receipt information to Xero. From inside Zapier, you create a zap which connects everything together and sends the data to Xero. Don’t be daunted, this is a pretty simple point and click process and you are guided through each step. 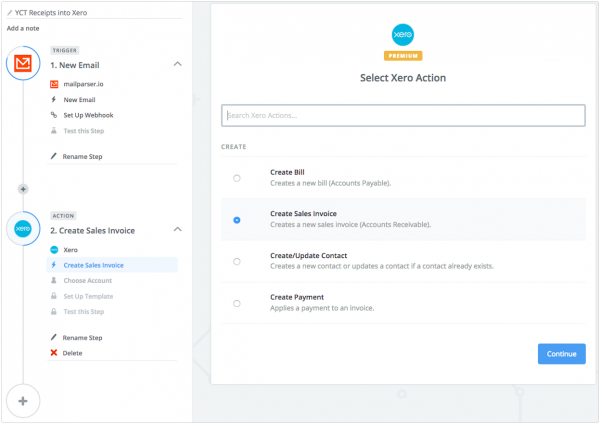 Once you have this created, you set it to active, and from that point every new receipt created in YourCloudTelco will appear as a new invoice in your Xero account. 5. Forward payment receipts to mailparser.io. A copy of each customer receipt created is sent to your account email address. Set up a rule (via your mail server) to forward the receipt email to the mailparser.io inbox you have just created.